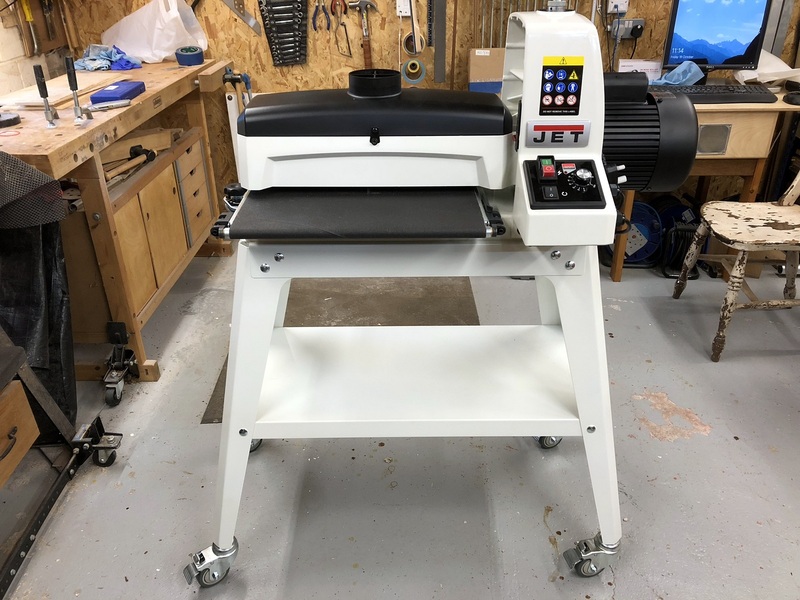 I had been promising myself a drum sander for quite a while and I had a visit to an Axminster store (Warrington UK) to have a look at what was available. However I dismissed the more expensive Axminster and Powermatic sanders as they were much too big for my modest 410 square feet shop. This left the two Jet machines as contenders. 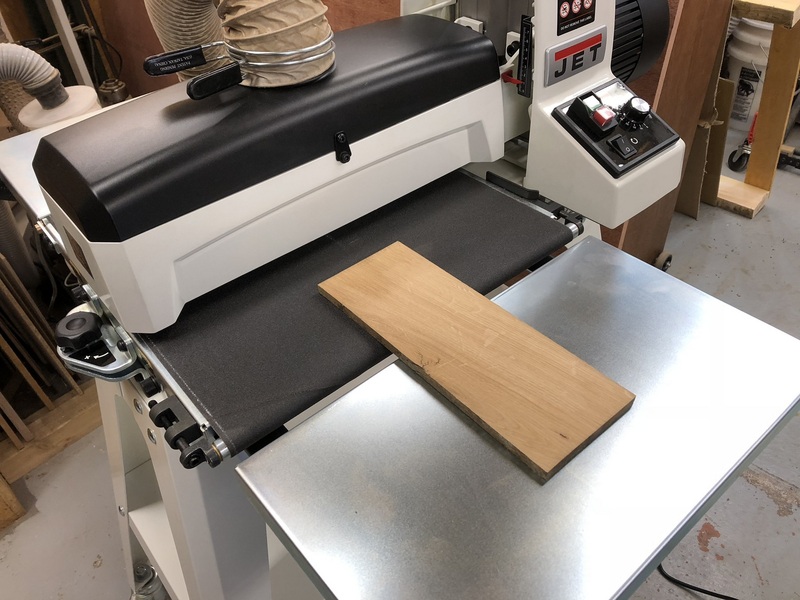 Most of the work I do needs the larger capacity of 32" and some guitars I make are less than 16" width so can be run straight the the sander in one pass. I dismissed the older and smaller Jet 10-20. This left the excellent JWDS 1632 which has been recently redesigned. The new features are the easy tool-less abrasive retaining clips. This make changing belts an absolute breeze. The other new features are the conveyor drive motor now pulls the workpiece through the machine, rather than the previous push method. This is supposed to give a much better finish. Sandsmart™ control continuously monitors the sanding load and automatically reduces the speed of the conveyor if the load becomes too high. Conveyor bed parallelism is adjusted by turning a simple dial exactly like the much praised Powermatic PM2244. This alone is well worth the outlay to buy this excellent machine. 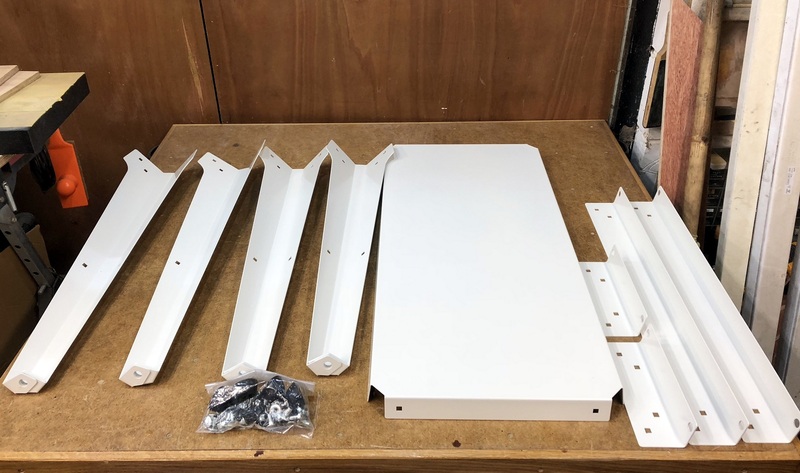 So I ordered one and added the extra infeed/outfeed tables and the castors. As my shop is relatively small I need to have the ability to move every machine around. The sander arrived the morning after I ordered it with free shipping from Axminster Tools overnight - astonishing! The shipment comprised 3 boxes on a pallet one of them very heavy. The first thing to do was to unpack the box containing the stand. This is a very substantial folded steel structure which is made from 0.1" (2.54mm) thick heavy gauge steel. This has been powder coated with a white finish. The nuts and coach bolts are made from high tensile steel. All very promising so far. 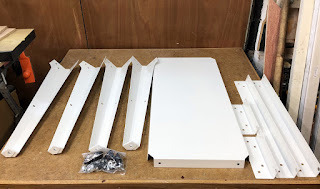 The instructions in the manual are very easy to understand and assembly of the stand on my assembly table took about 30 minutes. 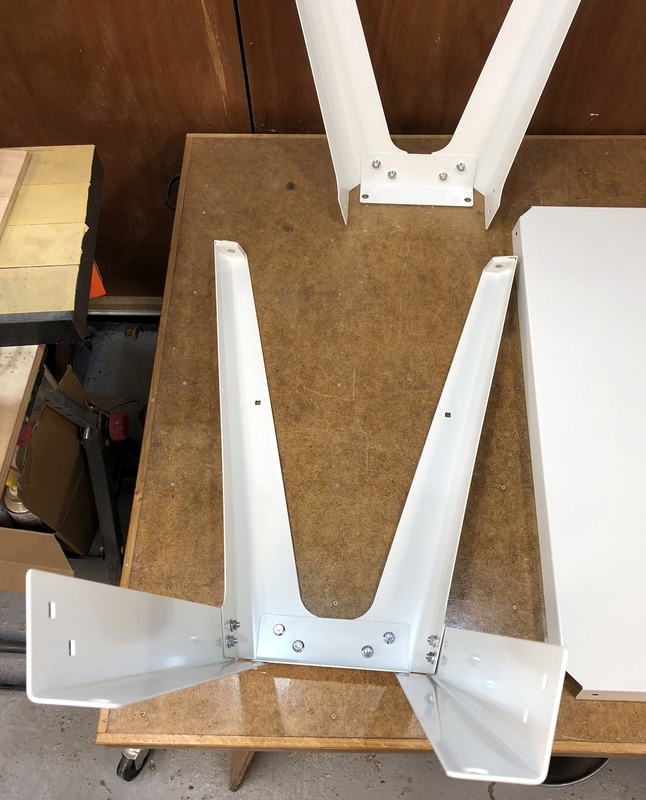 The only thing to watch was to make sure the stand has a few components which require holes lining up with each other making up the top of the stand. I used a couple of 3/8" drill shanks to ensure the machine would mount properly. Assembly of the stand was then relatively straight forward. The nuts were only finger tightened at first and then the stand stood on its feet to settle. Then the nuts were fulled tightened with a 12mm socket. I'm not sure what size bolt would be supplied to the USA. The casters were then installed. 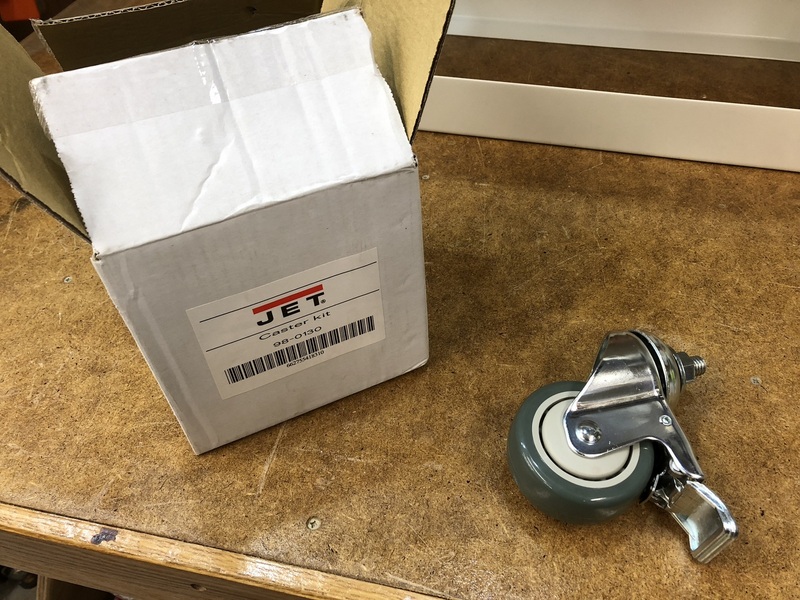 It is not necessary to have a thin wrench to hold the fixed portion of the caster shaft as you can get enough grip with your fingers on the circular cup part of the caster. Tighten the caster with a ring wrench while holding the cupped part of the shaft. Mounting the machine to the stand. The machine is very heavy and can't really be lifted by one person so either get a helper or use and engine lifting hoist to lift it out of the box. I got a helper to assist me and we lifted the machine onto the stand temporarily at 90 degrees to its fixed position. 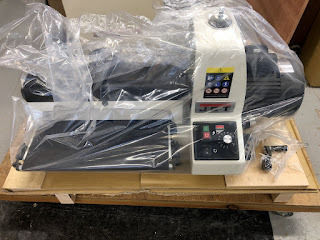 This is so the plywood boards can be removed from the bottom of the machine along with the plastic bag the machine is wrapped in. Then the machine was turned through 90 degrees to its final position. There are 4 holes with welded captive nuts on the underside of the machine which align with the holes in the stand. Then the 4 cap head screws that held the plywood on are inserted, tightened and the assembly is complete. All that is left to do is mount the winding handle onto the vertical shaft protruding from the top of the machine. The handle is secured to the shaft with an integral socket grub screw. The handle was then wound to open the mouth and there was a small transportation spacer to discard. I had purchased the extra infeed/outfeed tables which effectively double the support area of the machine. These are mounted to the machine using 4 brackets and some more cap head allen screws. 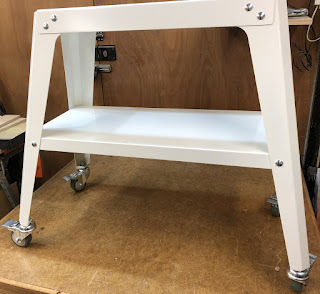 It is essential that the tables are mounted slightly below the level of the conveyor. I use a 1 metre long steel rule on the conveyor surface. 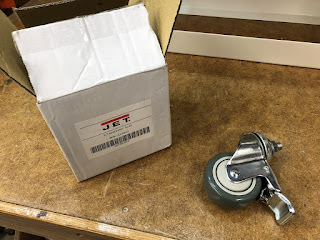 This is gently clamped to the conveyor simply by winding the stationary sanding drum onto the rule. Then I used a thin steel rule as a spacer to adjust the infeed table (on its slotted holes) to give the desired clearance. This procedure is repeated for the other side of the infeed table. Then the same procedure is repeated on the outfeed table. After plugging the power cord into a UK 13 Amp 230 volts socket I tested the machine for power. There are a pair of push buttons one green and the other red which are self explanatory. The green turns on power and the red turns it off. The other controls are a rocker switch which turns on the power to the sanding roller. The first thing to do was connect a 4" flexible hose connected to my dust extractor to the top mounted 4" port. I started with a planed 12" length of oak that still had planer ripple marks in. 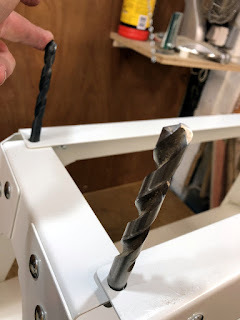 While the machine was stationery I wound the depth handle until the sanding roller just touched the board then I backed the sanding roller off a hair. Then I removed the board and started up the machine. As I hadn't used it before I set the conveyor speed at 50 and switched on the drum motor. Then the oak board was placed onto the conveyor and it pulled the board through the machine. All worked ok but as the drum was retracted slightly no sanding took place. I would the handle down a quarter turn and fed the board through again. Sanding took place and I was surprised just how quiet the machine is. No ear defenders needed. Another quarter turn and another pass resulted in total removal of planing ripple. The machine is supplied with 80 grit paper. I then turned the board over and did the same on the other side. The finish obtained was suitable for running an orbital sander over. You can of coarse buy different grits and the quick change spring clips facilitate quick grit changeover. I had bought a couple of rolls of Abranet 3" x 25metre long abrasive, 1 roll in 80 grit the other in 120 grit. Removal of the original abrasive was super quick. The length of the original Jet supplied abrasive is roughly 2.3 metres which is just less than 8 feet. I decided to make up a template to cut my own abrasive. I used a sheet of 8 x 4 ply and cut off a 5 " width 8 feet long. I then placed the original abrasive onto the board and held it down with spring clamps. Then using a Sharpie I marked the cut length and the end shapes onto the plywood. Then it was a simple matter of laying the new abrasive onto the plywood and using a box cutter cutting it to length and the end shaping. 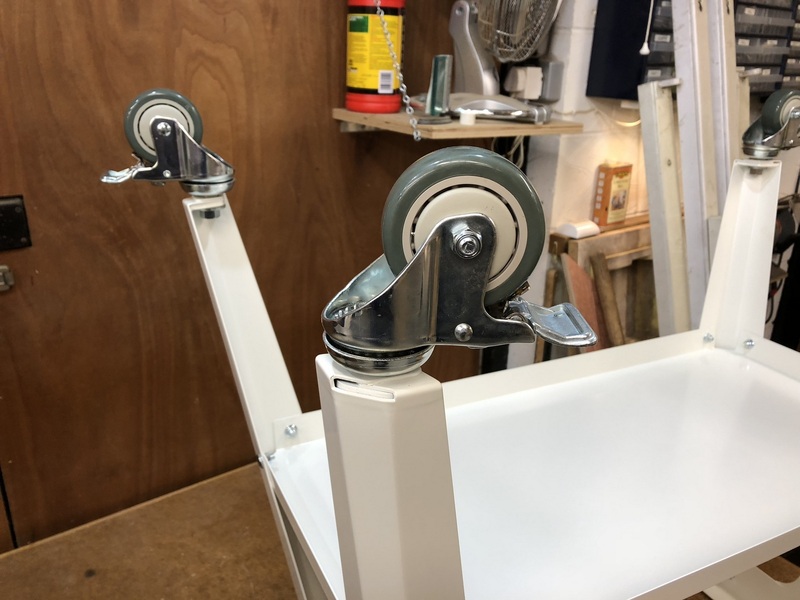 Installation onto the machine is really easy using the integral spring clips on the roller winding the abrasive in a tight spiral ensuring that there is no overlap anywhere. The only thing I found was that the abrasive wore out my box cutter very quickly! It is abrasive after all. I ran through a board wider than the 16" width to test drum parallelism and found that out of the factory is was spot on. There was no discernible ridge when the board was rotated through 180 degrees and run through again on the same thickness setting. If there was any adjustment needed then there is an adjuster on the open cantilever end and it looks super simple to adjust. Dust collection was excellent and left only a tiny amount of dust on the conveyor. You do need an extractor with decent extraction flow rate though. 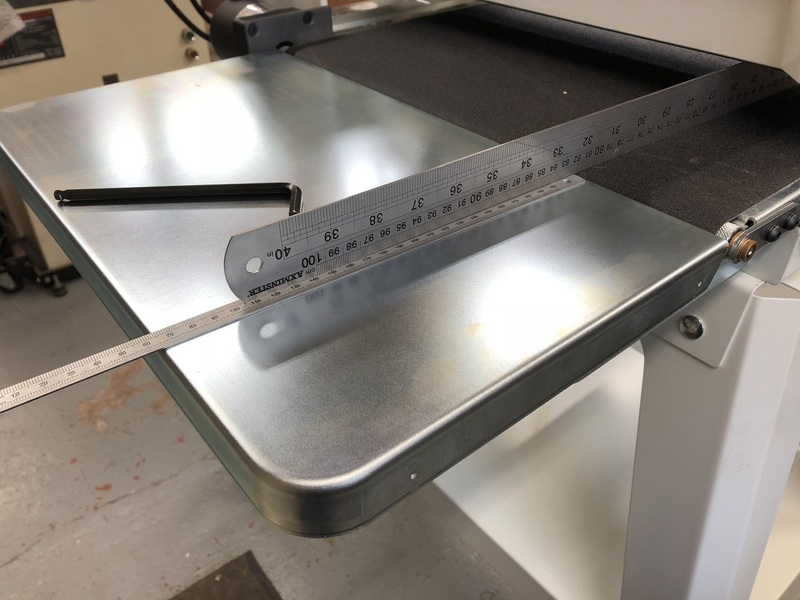 This is an excellent addition to a small workshop and as the machine is trade rated should be able to run long hours every day without issue. The addition of the parallelism adjustment was a deal winner for me. There are no other machines at this price point with this excellent adjuster currently on sale in the UK. The nearest thing is the Powermatic PM2244 which is a considerable larger machine with a hefty price tag. The machine is extremely well made out of substantial materials and comes with Jet's 3 year warranty. It should last me a long time. Now I'm off to the shop to play with it. A customer brought in a table that had seen better days. It needed its shellac finish refinishing. It was also a little rickety. On closer examination it was literally nailed together! There were no joints to speak of and it needed serious work to make it stable. 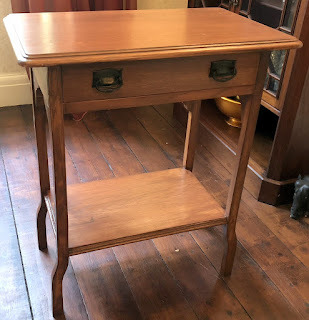 I told my customer it would need extensive work but as she liked it and it had no intrinsic value as an antique (laughs) she was happy to see it "remade". To go about this I dismantled it completely. Not very difficult as the nails came out very easily. The top had been nailed on from the underside and had a dowel protruding from the top of each leg into the underside of the top. 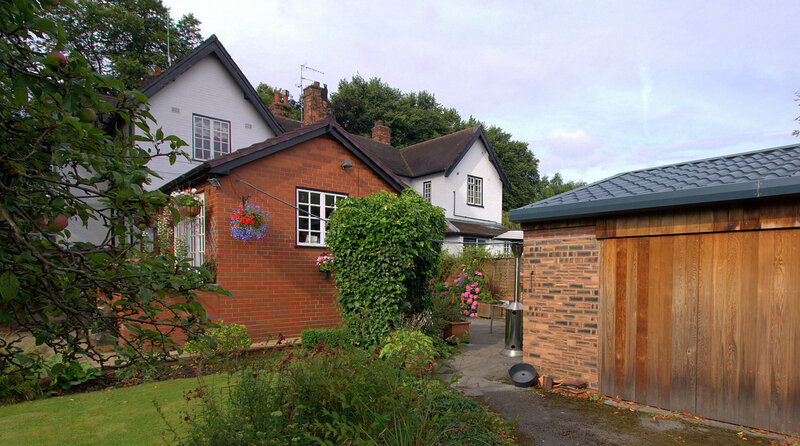 Needless to say over a period of years, moving it into central heated houses had resulted in the top splitting down the middle. She wasn't even aware of this as she covered it with a cloth and stacked a computer on it. The front of the drawer was dovetailed to the sides but the glue had long ago disintegrated. In fact the single wide dovetail was the only thing holding the drawer front onto the sides! The drawer bottom was very thin plywood that protruded from the back. This protrusion had been used as a drawer stop on the inside face of the rear of the carcass! Also it looked as though a bottle of ink had been spilt inside the drawer at some time in its history. Fortunately only the drawer bottom was damaged and a few splashes on the inside of the drawer sides. Anyway after it was all dismantled I set about correcting it. First of all all the ends of the stiles/stretchers needing squaring up and cutting to identical lengths. Originally they had been cut at odd angles and looks as though they had been chewed to length. It appeared to be made of English oak as it had prominent medullary ray fleck patterns. However it did not smell like oak when cut. I then thought it might be English sycamore which also exhibits ray fleck on quartersawn examples. Next I made sure the legs were all the same length and squared off both ends. Then all pieces had their shellac removed with a cabinet card scraper. I also used a random orbit sander to 180 grit. I set about cutting routed slots for floating tenons in the legs/stiles and stretchers. I don't have a Festool Domino but you get the idea. I also made some tenon stock on the router to the correct dimensions and rounded them off to fit the slots. A dry fit revealed that everything was OK. I cut some notches for the lower shelf. Then the lower shelf was cut to length and width to fit. Next the ornamental brackets were squared up on the table saw. Again they had previously been chewed to shape! I glued them into place using Titebond regular but only on the long grain faces. After leaving overnight something had moved and the table rocked slightly. A few passes with a block plane on the two offending legs soon corrected it. Then this left a rail onto which the drawer front would go. As there had been a narrowing of the table caused by me cutting the stretchers square the drawer front was a little too wide. I cut the front to fit the "hole". I then set about cutting the pins slightly deeper. The sides fit in OK and just needed their rear ends cutting square and a rabbet cutting in the trailing edge. A new part of the drawer was the rear panel that I made from some scrap oak. I cut a wider drawer bottom groove in the sides and front to suit some 6mm birch ply I had in stock. Then I glued the drawer back together and dowelled the rear on. As the dovetails were not very good I also dowelled the drawer front on and left it overnight to cure. Next day I cut off the protruding dowels and planed the drawer to fit the table. Then a drawer bottom was made and slid into place. This was secured on the back edge with a couple of 2.5mm countersunk head screws. 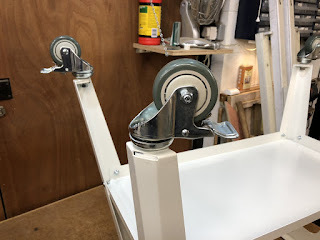 I just had to glue in a couple of drawer runners and side packers to make the drawer run smoothly and without crabbing. I run this over the table saw to cut out the split. The original glue had given way long ago but it was still holding together ... just. I then run both segments through a jointer/planer to get them to a uniform thickness. Then using complimentary jointing method I run the jointer plane over the two mating edges. The top was then glued together with no issues and left overnight to cure. The next day the top was scraped flush at the seam and the moulding imperfection on the end grain was scraped flush. The results were not perfect but I was not after perfection on this job. Everything was sanded to 180 grit using a random orbit sander and the mouldings on the lower shelf glued and nailed back into place. I only glued the pieces in about 2" (50mm) at the centre of the end grain and rely on nails on the extremities. This will minimise it popping off when the wood expands/contracts across the grain. My customer liked the original dark wood finish but was happy to let me do whatever I liked to it. So I decided to stay darkish brown. I chose General Finishes Early American waterborne stain as it was fairly close to the original. This needed to be applied in at least 2 coats lightly sanding between with wet and dry 600 grit. 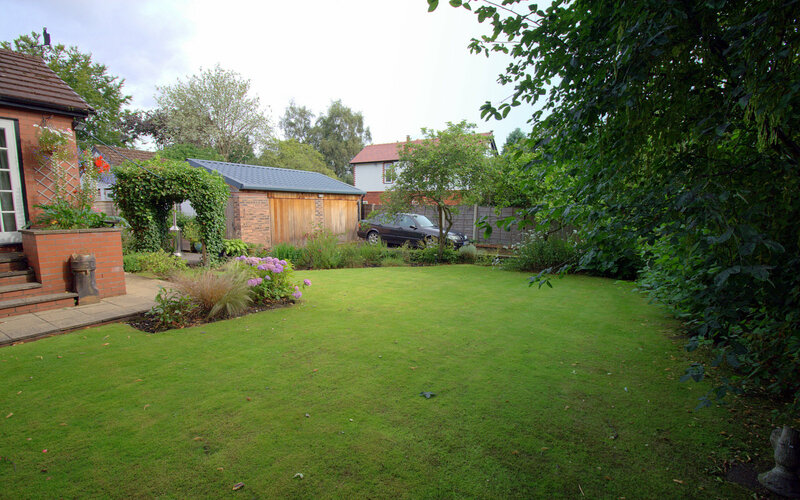 The top coats were General Finishes High Performance Satin as it is another waterborne varnish but is colourless and hard wearing. Finally the drawer runners were given some Renaissance Wax and the original drawer pulls fixed in place. I made some figure-8 table connectors from some brass sheet and secured the top to the frame. The job was then finished and returned to the customer. My freestanding shop in the garden was rebuilt from ground up back in 2012. Since then its space usage has inevitably evolved and is in a constant state of flux. Storage space is always at a premium in a small shop such as mine. It is around 410 sq feet in total and this used to be a two stall car garage so you get some idea of its size. I spent many years working out of toolboxes in the original shop but storage was so disorganised I would look for a tool, not find it, end up going out to buy another and then find the original some time later. I would then end up with double or triple of the same item. Something had to be done to storage.